What a great way to try out a variety of new premium golf balls. The Golf Ball of the Month Club is a great gift giving idea for that golfer in your life. 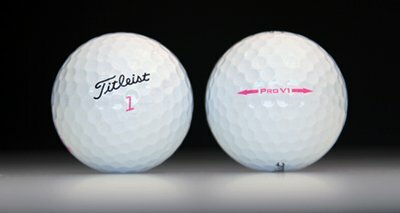 All of our golf balls are on the Golf Digest Hot List of the year! You can also choose to purchase a golf mailing plan of 3 months, 6 months or 12 months! Each month the selected golf balls will be delivered to your door the first of every month! Titleist Pro V1 Golf Balls, Bridgestone Tour B330-RX, USA Nike RZN Platinum Golf Balls, Nike RZN Red Golf Balls, Taylormade Rocketballz, Top Flite Gamer Soft Golf Balls, Titleist Velocity Golf Balls, Callaway X2 Hot Golf Balls, Callaway Supersoft Multi Colored Balls, Srixon Z-Star Golf Balls, Wilson Staff Duo Golf Balls, Bridgestone e5 Distance and Control Golf Balls. See below for detailed description of each brand. 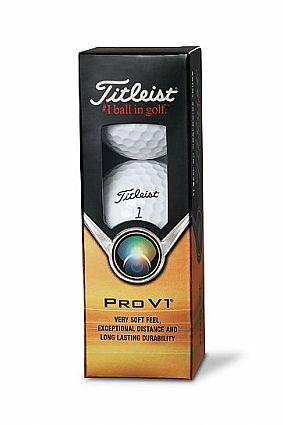 Tour-proven around the globe, the new Titleist® Pro V1 Golf Ball is engineered to deliver exceptional distance, consistent flight, very soft feel, Drop-and-Stop™ greenside control and longer lasting durability. 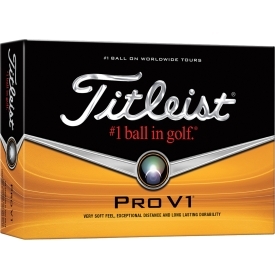 The multi-component construction of the Pro V1 golf ball uses a softer compression ZG process core technology, features a responsive ionomeric casing layer, and an improved high-performance Urethane Elastomer™ cover system. These golf balls will make you do a performance double take. Longer off the tee and soft around the greens. The Wilson ® Staff Duo Golf Ball is the longest ball that Wilson ® has ever made and it is softer too. The distinctive feel will set this ball apart from all of the distance balls. A great ball to improve your all-around game this season. Gain more distance even with slow speed when you use the Top Flite® Gamer Soft Golf Balls. These golf balls come designed with a 3-piece low compression construction and a high-resiliency core combination to provide longer distance for slower speeds. The Dimple in Dimple™ Aerodynamics technology relies on design to gain maximum distance, and the durable cover promotes greenside spin. Increase distance and precision from the tee box with Velocity Golf Balls. A reformulated proprietary LSX core creates a faster initial velocity, decreasing spin and increasing ball speeds for explosive distance. NaZ2 cover formulation delivers consistent ball flight and peak trajectory on every important drive. The spherically-tilted, 328 tetrahedral dimple design gives the Titleist® Velocity Golf Balls optimized ball flight and performance. Send each drive into orbit with Rocketballz Golf Balls. Engineered with a faster and longer design than previous Rocketballz, each ball features SPEEDMANTLE® technology for increased velocity for all swing speeds. A soft lothane cover features a 342-dimple pattern and provides a crisp feel at impact and a straighter, truer flight after impact. The innovative 3-piece construction gives TaylorMade® Rocketballz Golf Balls added playability. The Z-STAR has been re-designed, re-calculated and re-formulated to improve performance. SPIN SKIN™ coating is both soft and flexible, giving players twenty percent more friction between the club and ball for improved control on the green. The Speed Dimple design reduces drag so the golf ball soars through to air on its way to the green. The combination of these technologies and the Gradient Growth ™ core ensures STAR performance. The Nike® RZN Red Golf Balls come designed to gain more distance. The faster and lighter RZN core allows the ball to easily gain more distance, while the lower driver spin provides a longer carry. The seamless dimple aerodynamics reduce drag and advance flight trajectory while the soft top coating increases greenside spin and control. Built for a better feel and performance, the Nike® RZN Platinum Golf Balls provide you with the coverage you need to swing for an ace. The Speedlock Technology enhances high speed and distance, and the softer compression provides a smoother hit. Designed with the RZN core and mantle combined, a faster speed is obtained, while the RZN core with the heavier layers provide a more stable ball flight, perfect for the windier days. Increase distance without sacrificing feel with the SuperSoft Golf Balls. An ultra low 38 compression design reduces spin and generates maximum distance with every club. The Trionomer blend cover with HEX aerodynamic patterns deliver a soft, crisp feel and accurate ball flight. A 2 piece core design optimizes distance and delivers increased control on important scoring shots, giving the Callaway® SuperSoft Golf Balls ultimate playability. Bring the heat with every shot by using the X2 Hot + Golf Balls. Designed for golfers with aggressive swing speeds of 90 mph and above, this 3-piece ball features HEX Aerodynamics to optimize lift and drag. The Trionomer cover and fast tech mantle design promotes maximum ball speed while also delivering superior feel and control for virtually any shot type. Burn up the golf course after every shot with the Callaway® X2 Hot + Golf Balls. Maximize distance with every club by using B330-RX USA Golf Balls. Designed for the average player looking to increase depth, these balls feature a dual mantle design, which reduces spin and increases launch off the driver and long irons. A urethane cover with 330 dual dimple technology features limited edition USA graphics and provides greenside spin control and consistent flight, giving the Bridgestone® B330-RX USA Golf Balls playability. Distance golf balls don't have to let you down on the green. The Bridgestone e5 golf ball delivers with a Urethane cover for great stopping power and it's advanced 2-layer construction promotes higher ball flight and longer carry distance. A larger Dual Dimple reduces drag and generates higher speeds and increased lift for longer flights.